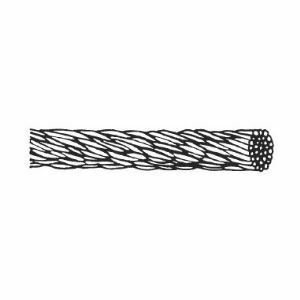 UL Listed28 strands of 14 gauge (1.63mm) basket weave aluminum cable. 115 pounds per thousand feet (172 grams/meter). 115,047 circular mils (58mm2) of conductivity. UL Listed28 strands of 14 gauge (1.63mm) basket weave aluminum cable. 115 pounds per thousand feet (172 grams/meter). 115,047 circular mils (58mm2) of conductivity. Exceeds Class I requirements.